Here's my rather plain linen stitch. I really like this color. I'm in like with my linen stitch. It works really nicely on cotton, makes just the fabric I've been searching for - dense but flat, with a nice drape, not stretchy. I have about an inch done, tried to take a picture, it looked like crud so I scrapped it. Maybe tomorrow I'll a.) have more to take a snap of b.) be able to go outside (huge rainstorm right now). So I was tooling about to see other people's pictures of linen stitch, and found some really nice ones. The stitch looks quite different in wool, lighter and more textured and look what it can do with color! Here's another one. Sort of has bohus feel to it, doesn't it? Sometimes the simplest things can just knock your socks off. I'd never have thought something so simple could be so cool. I tend to be bad about writing down what I've done, esp. so if I wait until the end of the project when I've moved on. So I'm going to go ahead and post this one before it's done - so fair warning. By all means, use and edit as you like, but this is my untested math. A note about materials and stitch choice - I love cotton and cotton blends, but to knit sweaters from, I always end up with a stretchy mess. My sunflower pullover from last summer is a good example; wear it for a day and the sleeves are down to your knees. I did figure out a band aid for this - pick up and crochet along the back of the piece vertically ala the Yarn Harlot's directions, but still, I wanted something better. So this time, I'm trying to use a more reinforced stitch that will produce a more stable fabric that won't get all yanked about by it's own weight. After some swatching, I choose linen stitch. It's strong and stable, visually very appealing (I think, esp. 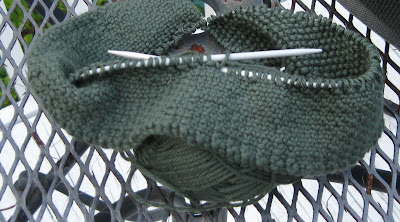 for knitting because it gives a cool faux woven look) and works in Cypress green. This sweater is knit front waist seam to back waist seam, picking up for the sleeves as you go, and casting off for the neck. I've incorporated pockets (the whole pattern is a riff off of le bouton's 3 pocket wool pull) and I'm not sure what I'll do with the neck yet. Pictures and updates to follow . . .
Linen stitch: abbreviated as L.S. Cast on 32 sts, work in linen stitch until pieces measure 5 inches, ending with a WSR. Place all stitches on scrap yarn and set aside. Cast on 130 sts - work L.S. until piece measures 7 inches, ending with a WSR. Next row - work 18 sts., place next 32 sts. on scrap yarn, place first pocket on left hand needles and work these 32 sts. work next 30 sts., place next 32 sts. on scrap yarn, place second pocket on left hand needle and work these 32 sts., work remaining 18 sts. Continue to work L.S. until piece measures 17 in. ending with RSW. 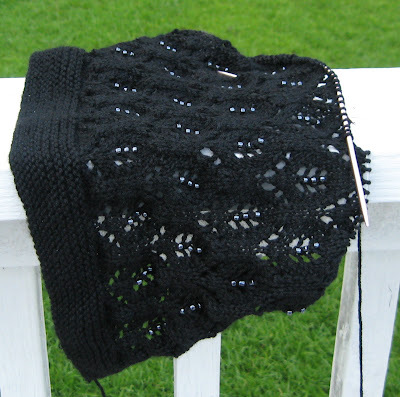 Next row, cast on 84 sts. and work these 84, then work 130 sts. of body, cast on 84 sts. onto left hand needle with spare main yarn and knit across these sts.. Entire piece now equals 298 sts.. Continue to work until L.S. piece measures 22 in. ending with a WSR. Neck: Next row, work 124 sts., place center 50 sts. on scrap yarn, attach second ball to other side and work remaining 124 sts. Cast off 2 sts. on each side of neck on the next 3 RSRs, leaving a total of 118 sts. each side. Cast off 1 st. on each side of neck on the next 1 RSR, leaving a total of 117 sts. each side. Work L.S. until peice measures 29 in. from bottom edge, ending with a WSR. Next row work 117 sts. of first side, with spare main yarn cast on 64 sts. and work across these to close the neck hole, work remaining 117 sts..
Work until piece measures 37 in. ending with a WSR. Next row cast off first and last 84 sts..
Work until piece measures 54 in. from front hem, bind off all sts. evenly and sew up side seams. 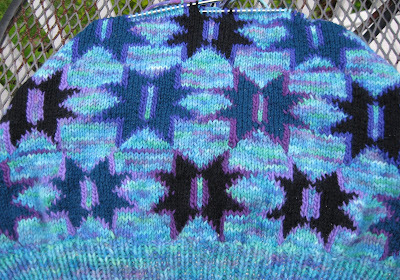 Just talking to the Yarnist (who is changing her address, I'll update my sidebar) about intarsia. She asked if I had any ideas about keeping intarsia tension even. Since I typed it all out, I'm control v'ing it here. She's working on a baby blanket, which is sort of perfect for intarsia because it's small(ish), flat, usually in fun colors and with fun designs to keep you interested. "Getting intarsia to be even, that takes a bit of practice. Unhelpful as this will be on a baby blanket, wool would be your best friend, as it's most forgiving and will lock itself up, assisting your efforts. You need to be sure to twist the stitches every time, and keeping your tails short (at first at least) will help you manage the tension. If the tails are too long, they'll get pulled and then things will get wonky. Try to keep your work just a hair looser than you'd be comfortable with on a "normal" piece, but very even. I don't know if you weave in ends as you go, or do them all at once when your work is complete, but I'd advise method two when starting out, it gives you a way back in to fiddle with tension after the fact - whether you have problems with your work being too tight or too loose. Once done, if the work is a bit loose, wet blocking can solve most minor issues. You can also supplement a complicated, multi-color piece by using Swiss darning after the main knitting is done, fewer colors makes intarsia easier." What else . . . I've started on Matrix 2, haven't yet made it to the beads, so no snaps yet. Maybe I'll call this one Iron Man. :) Yes, originally I was thinking of the Ozzy Osbourne song, but once I did some reading, I think I like the cartoon character better. And yes, there is no real relationship to knitting at all with that name, it's not a clever reference, I just think the beads look like hematite. Come to think of it, maybe I just have a fascination with cartoons as an adult because I only had 2.5 television stations growing up and one of them was PBS. Oh, and I have 13 balls of Comfy in Cypress. I want to make a sweater knit from front hem up, increase out for the sleeves, up over the head, down and over. But Comfy is so soft, I fear horrible stretchiness, so I'm on a quest for a nice simple, dense stitch pattern for it. Prepare for swatches, I guess. That subject line pretty much says it all. 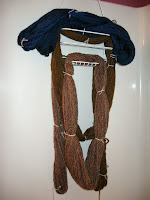 The extra yarn in sandalwood and patina is complete, as are a couple more skeins of Soryu (almost done spinning that). Tune in next week for the new version of the Matrix. Sort of reminds me of Batman, actually. Thinking about doing the Matrix again in white. Maybe a foot longer, a couple inches wider and it could be a really nice holiday wrap. But I'll be darned if I can find the right bead color to go with white. Needs to be size 6, white or off white with some pearly colors seems like it would be great, but I can't find what I have in mind. Here's a possibility Size 6 2-Tone Silver Lined Pale Green & Tanzanite Round Japanese Seed Bead, from Fusion Beads. The purple blue and green blue shimmeriness (made up word) remind me of a clean snow field on a bright sunny day after a big storm. It gets nice and cold and there's all this sparkle to the snow that has all these colors in it. Any thoughts about how it would look on knitpicks Bare merino/silk? When I was a kid, my favorite TV show was Get Smart. Hands down, best show ever. I wanted to grow up to be a spy and work with Maxwell Smart and talk into my shoe. Maybe not the shoe part, but maybe you can understand the fascination when I was 7 or so???? I thought Max was hilarious. And tonight, my knitting sort of started speaking to me in his voice. Me: You think you've got me, but I have this whole intarsia thing under control. Yes, all 600 little strings of it. Sweater: I don't believe you. Me: Would you believe I'll be sewing on buttons before I turn 50? Me: How about we call the cat over and see how tough you are then? You see, I cast on for the sleeves tonight, so I'm now knitting across from cuff to cuff, about 280 stitches, so running about 170 individual pieces of yarn to make the designs (most between 3 and 9 feet long, hence that rat's nest you see in the picture). Weaving in ends as I go, trying to keep the tension correct, attempting to keep the colors random. Would you believe I fear my own knitting basket? Yes, Max, I sure would. So here are 3 skeins of my spinning from the past 2 weeks. None of it has been set yet. Soryu is 2 ply, and very lightweight compared to the single of sandalwood (this is most of the 8 oz. I'll finish this up tonight and start on the patina). I've heard that some hand spinners have a hard time making good singles as they end up spinning too tightly and making too fine a yarn. I must have a great relationship with my wheel, this works for me. The singles are so heavy compared to the 2 ply, really dense and solid. If the 2 ply is like an afghan hound or a grey hound, the singles are like a tubby black lab (even down to the tail wagging). I've never had both of my own spinning on hand to compare, but as I took them both back to the porch for a photo-op I was struck by how heavy the singles are. And I like them that way. And, spinning singles is a lot faster than plying, which can be very satisfying. Other things I've been learning lately, how to take slightly better color adjusted pictures of my work with the camera by playing with the settings. AUTO doesn't actually work for every situation. What else, how long it takes to pump out our 1,500 gal. septic tank (about 40 minutes). No emergency; just maintenance. We don't want emergencies in that department, thanks. Oh, and that it was high time I cut my hair. I'm like a comet with cutting my hair. Guess it was year 76 today. Okay, Soryu is on hold for the moment. The sweater that is being designed and knit from the sandalwood and patina mohair has run out, so I'm spinning up 8 oz.of each so the final sleeve can be completed. It's a single, so it's pretty fast going. I did this half bobbin while we watched Scooby Doo and the Mummy's Curse this morning. But in addition to this, I am also going to try and branch out a little more. So here we have 2 lb. of Gotland and 8 oz. of superfine black alpaca. 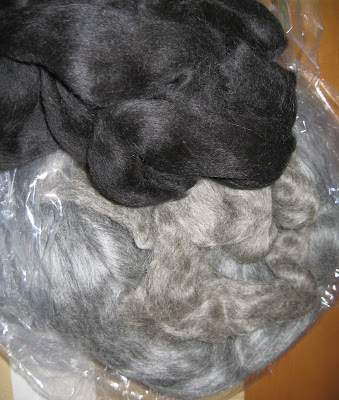 I expect the Gotland to be easy to spin (it really smells like sheep, and it's been processed, so it must be pretty paint-peeling when it's raw - needless to say lots of flashbacks to hanging out in the barn during lambing season) and the alpaca to be challenging. I think the Gotland made up into a nice, sport to DK weight 2 ply is just what I want for the fishing shirt design . . . . So, I sent the Matrix to my mom. Loved the color, the pattern, thought it was very cool. She was going to show it around to her friends. The beads were so nice, how did I get them in there? So soft and the texture was perfect. She really thought it was great, but . . .
She thought it was "a little short". MOMS! You can't hide ANYTHING from them. Didn't I say it myself? I should have known. GAH. Of course she's right, but I was out of cosmos, and when it became available again, the dye lots wouldn't have matched. . . Excuses, excuses. She was right. Is right. It's a wee bit short. I gave her draping instructions (after confessing I knew she was right) for wearing the scarf and she thought it worked. "But next time maybe . . . you know, since people will want to wear it draped like a shawl . . ."
I'm thinking I'll do the next one in black. I love my mom. She can be really supportive; but she will never let you get away with a half-try job for a second. Or, at least not without a serious dousing of guilt. And you know, it just feels so good when people care enough about you to not allow you to slide or skate when you can do better; especially on something important to you. Haven't been away, or anything, really. I've just been plugging along on some stuff that's fun, but not real photogenic in terms of progress reports. Funnily, everything I'm working on is blue, or blue/purple/green. Summer I guess. Here's Soryu - I've finished about 600-plus yards (I measured them out tonight) and have about half the fleece left to spin. 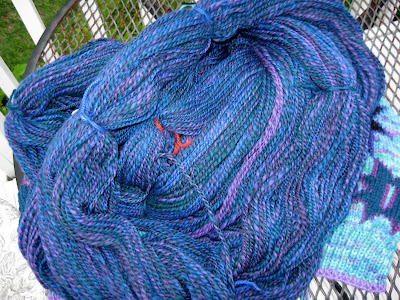 Nice, soft, good balance once I set it, but no spring -- but I want to swatch it, I think it would have a nice drape as a fabric. Maybe on 6's. And here are the stars - slow and steady wins the race on this one. It's pretty fiddly intarsia, so about half an hour a night is all I want to do. I think I need to start the fisherman's shirt design -- I need some straight knitting.